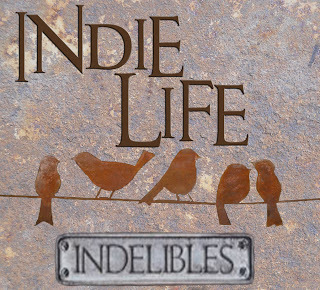 Welcome to my Indie Life post for October. This is a monthly feature posted on the second Wednesday of the month and hosted by the Indelibles. The aim is to promote, encourage, and support indie authors. A couple of weeks ago I wrote a post about climbing back to the top of my happy. I’d been feeling a little low and overwhelmed by all the things on my to do list, so I took myself out and away from it all to get some retail therapy for an hour or so. I purchased these from kikki. K.
Today I wanted to share some of the quotes with you, because sometimes we need something to inspire us to keep going. This is for all the Indies out there who may be feeling low and overwhelmed like I was. Courage is living each day of your life like it’s your last. Stay true to you and you will end up incredibly happy. Thank you! And good for you, taking back the love for writing instead of focusing on the never ending to-do list. I noticed a new cover on the sidebar -- it's gorgeous! Let me know if you'd like help promoting your new work. It looks like something that would fit well on my blog. My email is jrpearsenelson@gmail.com if you're interested in doing an interview, cover/excerpt reveal, etc.